1. Preheat the oven to 180°C, grease the muffin tin well. 2. Combine coconut flour, desiccated coconut, Xanthan gum, cocoa, cacao, salt, baking powder and bicarbonate of soda into a large bowl, set aside. 3. Cream butter and xylitol with an electric hand mixer, until pale in colour and fluffy. 4. Add the eggs one at a time, incorporating well before adding the next. 6. Once all the flour mixture is incorporated, add the boiling water in 1/3’s. The mixture should now be a smoother consistency. 7. Spoon the mixture into the greased muffin tin, and bake at 160°C for 20 minutes. Increase the heat to 180°C and bake for a further 10 minutes. 8. Test the muffins doneness with a cake tester/skewer (this should come out clean), remove from tin and allow to cool completely on a wire cooling rack before icing. 9. For the icing, combine all ingredients in a large bowl and mix with a hand mixer until light and fluffy. Store in the fridge for at least 15 minutes or until required. 10. 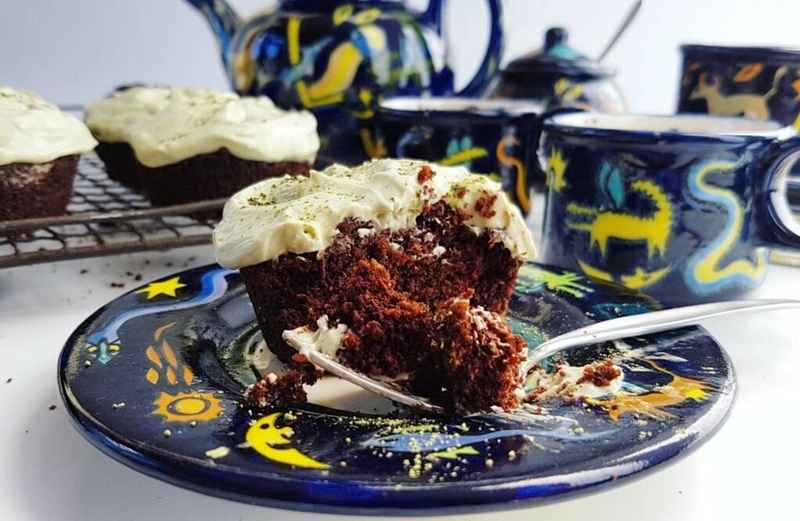 Once the muffins are completely cooled and the icing has chilled slightly, top the muffins with a dollop of icing, spread and finish by dusting with Matcha powder.